Please join for cocktails & hors d'oeuvres for a celebration Special Guest Sister Helen Prejean's 80th birthday to raise money for local nonprofit, The National College of Capital Voir Dire (NCCVD). Sister Helen is the author of Dead Man Walking and a world renowned anti-death penalty activist. She will be celebrating her birthday with in Denver to help raise money for NCCVD which trains lawyers to fight the death penalty locally and nationally. Who's winning: Donald Trump or International law? In this talk, Harold Hongju Koh, Sterling Professor of International Law and former dean at Yale Law School and former Legal Adviser and Assistant Secretary of State for Democracy, Human Rights, and Labor at the State Department, will analyze and answer these questions, based on his recent book The Trump Administration and International Law (Oxford University Press 2018). 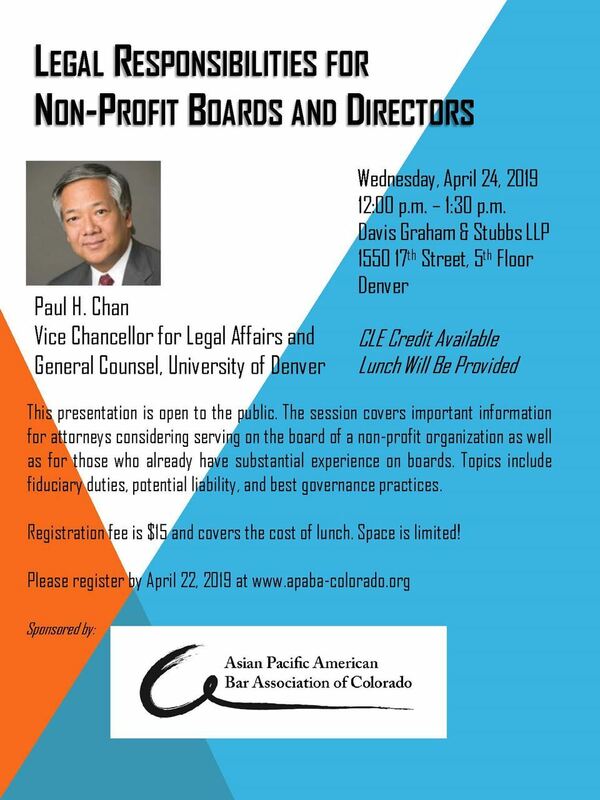 In an effort to promote greater diversity on Colorado's state court and Denver County Court benches, the Center for Legal Inclusiveness and the Colorado Bar Association are co-sponsoring a CLE program about how to become a judge. Featuring justices, judges, lay and attorney nominating commission members, Denver's City Attorney, and the Governor's Legal Counsel - as well as a closing plenary session with Representative Leslie Herod - this program provides you an opportunity to learn more about why you might want to consider applying to become a judge and how you can successfully navigate the application process. After the CLE program, you are invited to join the speakers for a reception in the atrium at the Ralph Carr Judicial Center. The Litigation Executive Council of the Colorado Bar Association is hosting a round table of representatives from the diversity bar associations for a discussion on diversity and inclusion. All are invited to join for this candid and informative event. Breakfast will be provided. Applied for one general CLE credit.